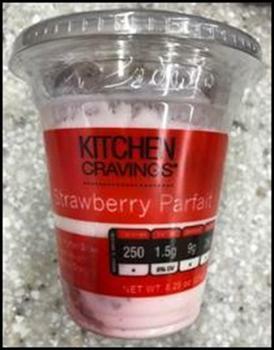 Kwik Trip of La Crosse, Wis., is recalling Kitchen Cravings Strawberry and Mixed Berry Parfaits. The products may contain traces of cashews or almonds, allergens not declared on the label. The Kitchen Cravings Strawberry Parfait comes in an 8.25-oz. cup, with UPC CODE 3977918435. The Kitchen Cravings Mixed Berry Parfait comes an 8.25 oz. cup, with UPC CODE 3977918436. The recalled products were sold at Kwik Trip convenience stores in Minnesota, Wisconsin and Iowa (Kwik Star) with a sell by date on or before December 6, 2018. Customers who purchased the recalled products and are allergic to cashews or almonds should return them to the place of purchase for a full refund. Consumers with questions may contact the company at (608) 781-8988 24 hours a day.